Google Plus keyboard shortcuts allow you to easily navigate your way through the social network with less dependence on your mouse. Google Plus developers introduced this feature in Google Plus as an edge to make your experience with the social network even more fun. I’ve compiled a list of the Google Plus keyboard shortcuts and hope they can really help you to navigate through the Google Plus interface easily. Below is a table of the Google Plus keyboard Shortcuts i compiled for your easy navigation through the Google Plus interface. 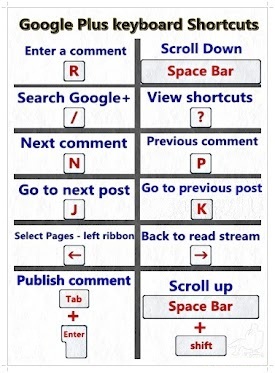 Below is the Google Plus Keyboard Shortcuts in picture. I hope you make use of it so as to enjoy Google Plus even more. Use the comment box below to tell me what you think about this post. Don’t forget to add me in Google+. Please Subscribe to NetMediaBlog Feeds by Email so you can be getting more of my posts on your email even when you are offline.